Hello everyone and welcome to my growing flowers tutorial!! 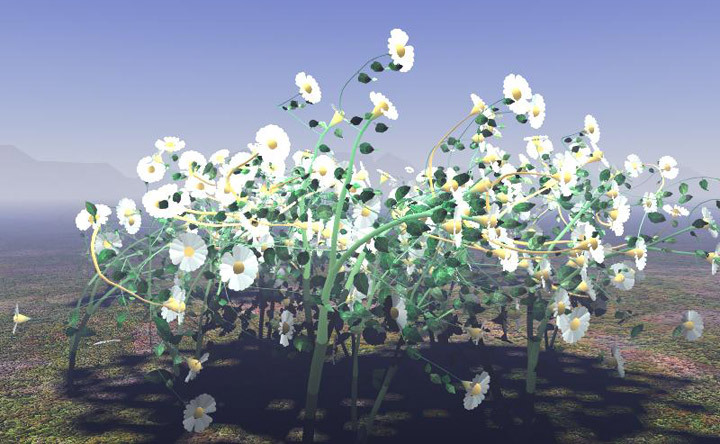 In this tutorial I will show you how to create growing flowers from surface; the flowers will gradually randomly grow up and will retain their original status when they reach to growing limit. Hope you have noticed this type of effect in the movie Mummy Returns where trees grown in the desert. This tutorial is pretty interesting dealing with Maya Visor, personally I like this kind of effects. Ok let's get started. Fire up Maya make new fresh scene, and then create a poly plane with the dimensions in the picture below or what ever you like, then use sculpting tool to give the plane terrain looking shape. Then create a spot light with the same parameters in the picture below. Note: I have used Quadratic in Decay rate because Quadratic has the soft edges while casting shadows. Hold down the (H) key from your keyboard then left click you will see pop up menus choose (Rendering). First select the plane and then go to (Paint Effects>>Make Paintable) now your surface is paintable and we can use any kind of paint FX. Go to your channel box and if its not opening or you in the attributes editor then hold down (Space Bar). Menu will pop up in the empty place and right click choose (Attributes) and then Channel box / Layer Editor. It’s time to play with other settings, open up attributes editor by (CTRL + A) click on the tab called (Daisy Small1) and then do the same settings or your preferred settings. Remember to check the box called (Forward Twist). Scroll down to bottom and expand the tab called (Tubes), then expand the (Growth) tab and then (Branches) tab and choose the following settings. Last but not the least, the important area where we will animate our flowers, expand the tab called (Flow Animation) you will see few options there and check all boxes called (Texture Flow, Stroke Time, Time Clip). Check them one by one, hit play button and you obviously will see the difference what they dose. Note: (Flow Speed) is dealing with the speed of flowers or whatever related with Maya's Visor how they grow fast or slow, the lower the values the growth is slower, higher value = faster growth, so keep this in mind. 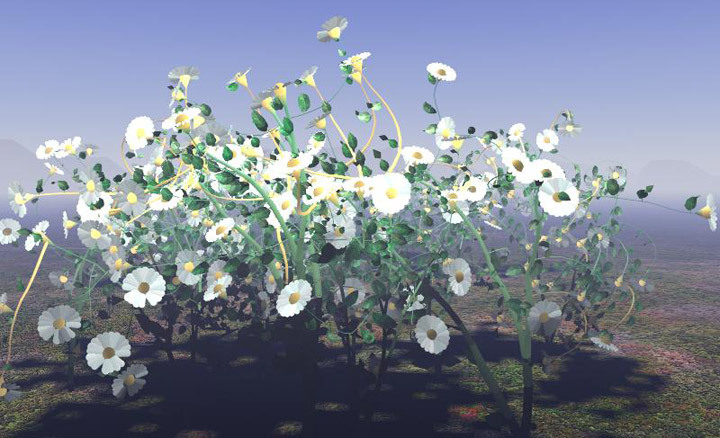 This concludes our tutorial, hit the play button and you will see flowers are growing along the time randomly once they reaches the growth limit stop's and affects by wind and turbulence. Here is couple of my test renders at different frames and you can see the difference between them.